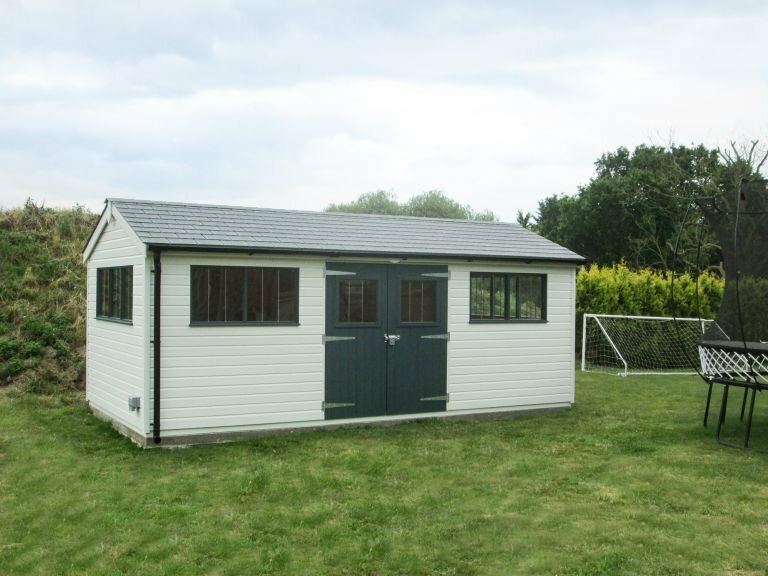 This large 3.0 x 6.0m Superior Shed has been installed in our customer’s garden in Middleton, Norfolk to have as a games room for their children to use. This shed will complete the children’s section of their garden, with goal posts and a trampoline situated next to it. 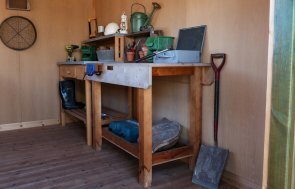 With insulation in the walls and ceiling, oak faced ply lining on the walls, and an electric pack with a heater, their games room will be suitable for year-round use. There will be room inside for a pool table, an air hockey table, as well as a bit of storage space for any extra outdoor games equipment. Heavy duty flooring will help take the weight of the tables, and will make sure the floor will cope with the activity there will no doubt be inside. Our heavy duty floor is ex 38mm thick as opposed to the standard floor being ex 19mm thick. 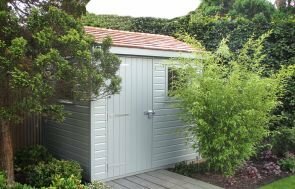 Externally, the customer has given the shed a striking look, with grey slate effect tiles on the roof, black guttering frames the front side, as well as two paint colours from our Valtti paint range: Ivory for the walls, and Slate for the doors and windows. A security pack consisting of a seven lever lock and heavy duty sliding bolt, security screws for the door hinges, and stainless steel window bars, completes this customer’s Superior Shed. 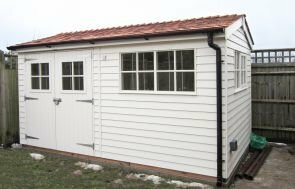 If you would like to know more about our impressive Garden Sheds, please contact us online, or come and see us at our Norfolk Show Centre and head office where you will be able to see these buildings and talk to our helpful team about your requirements.